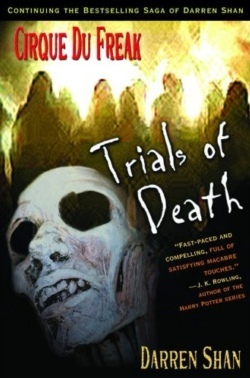 TRIALS OF DEATH — the fifth title in the compelling and chilling saga of Darren Shan — but the second part in a new TRILOGY, following Darren's initiation into the vampire clan. THE SAGA OF DARREN SHAN BOOK 5 Compelled by his loyalty to Mr. Crepsley, Darren Shan, the vampire's assistant, agrees to prove his worthiness to the vampire clan by undertaking a series of trials. Each Trial is set by the Vampire Princes to test agility, cunning and intelligence. Failure means death. Whilst their attention is focused on Darren, the vampire clan fail to notice that the vampaneze have infiltrated their mountain stronghold. Who is the traitor helping the vampaneze, and will Darren survive the trials to oust the vampire's greatest foes? Another atmospheric and terrifying tale from the author of Cirque Du Freak.